As you roam on your MTB, you need to make sure that you have everything you need. There is nothing worse than going on a mountain biking adventure for hundreds of kilometers, only to find out that you lack the essential gear. Mountain bikers need to pack survival kits, communication gear, in addition to hydration systems and a few snacks. A good bike backpack will provide the space you need for all your essentials. You need something that will combine functionality with capacity. It should also provide easy access and be comfortable to carry. But we understand that picking the right model can be tricky. However, if you are looking for the best MTB backpack then you’ve definitely hit the jackpot. In this section, you will find everything you need to know about 10 of the best sellers on the market. These are different models that have various features. This means that whatever your needs are, you will definitely find something that works for you. You don’t need a bulky backpack for all your needs. This narrow gauge design will help you carry all your essentials without weighing you down. It will never get into your way or confuse you even when it is full. It also comes with extra compartments and pockets to keep everything organized. It is the perfect balance between storage and size. This is not a heavy backpack, yet it is big enough for all your gear. Staying hydrated is a necessity when you are on a MTB. You need all your energy to keep going regardless of the weather. This amazing pack accommodates 3 liters of water which will be enough before your next stop. The magnetic snap allows you to drink without taking your eyes off the road. The best thing about this backpack is that it features cooling vents to keep your back cool. You will not feel hot or uncomfortable as you ride on rough trails. It also comes with hooks for your helmet and four-point compression straps to keep your pain-free. It is BPA free and comes in different shades to suit all tastes. Narrow design that will not get into the way. Easy on/off magnetic snap for easy drinking. Cooling vents on the back to keep you comfortable. The straps could use more padding to relieve pain. It is very important to choose a mountain bike backpack that will provide extra room without being too bulky. This is why we love this wonderful pack. The front floating pocket, the zippered pocket and the rollout tool pouch will give you extra room where needed. It even comes with a special pocket to keep your sunglasses scratch free. It also features side compression straps that will help stabilize the load for a comfortable ride. Want to attach more gear? No problem. You can use the lower straps to attach more accessories if you want to. The design of the hip belt and the harness will keep the backpack secure and close to your body for maximum convenience. 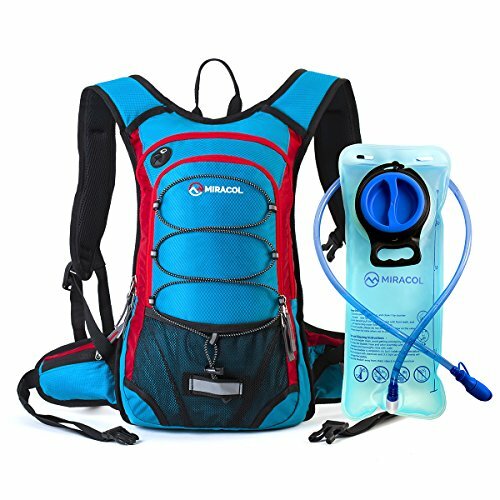 This is one of the best hydration packs as it features a 3 liters hydration reservoir that will keep the liquid stable in spite of your movement. The hydration sleeve is perfectly zippered with easy access to the valve during your ride. Breathability is a huge issue when you are on the trail. The back and the belts of this backpack are covered in mesh. The mesh covers a foam frame sheet that will follow the contour of your body to maximize comfort. This pack is lightweight and breathable to keep your body cool and comfortable even after a long ride. Lightweight nylon backpack with enough space for all your needs. Foam frame that will follow the contours of your body. 3 liter hydration reservoir with easy access. Mesh covered back and belts for maximum breathability. Special attachments for your helmet and light. It is difficult to fill the reservoir with water. A convenient backpack will help you carry all your needs no matter where you go. This is why it is a good idea to buy a high-quality backpack that will help you carry all your essentials. This might look like a small backpack but it has the needed internal storage to carry all your mountain biking accessories. It even comes with external hooks to carry your helmet while providing full access to your gear. It is quite affordable so you don’t have to worry about breaking the bank. With different colors to choose from, you will definitely find the perfect one for you. Who wants to feel hot on a MTB? The back of this backpack features air vents to keep you cool. You will not feel hot or uncomfortable even after a long ride in hot weather. Moreover, you will always stay perfectly hydrated thanks to its special design. Actually, it delivers 20% more per sip without affecting your concentration. You will not have to stop mid-way to drink because of its excellent design. It even features a magnetic tube trap that will keep your hydration tube in place with one click. Water will not leak even when you are mountain biking. You will be able to refill and seal the reservoir easily without taking your eyes off the road. Moreover, the internal tube prevents the growth of bacteria thanks to the Hydro guard technology. It is also BPA free. Affordable and convenient mountain bike backpack. Internal pockets to store all your needs. Back air vents for extra cooling. Hydro guard technology to prevent the growth of bacteria. Easy to refill and use water reservoir. The backpack is not waterproof. The magnetic trap of the tube is not very sturdy. Who said that hydration packs for mountain biking have to cost a fortune? 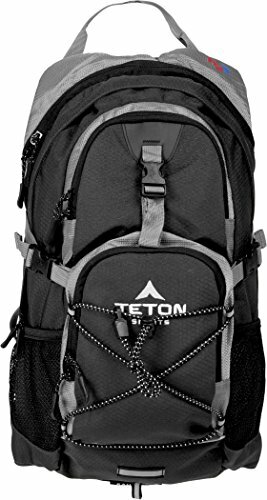 This is an excellent and affordable backpack that features adjustable straps. It fits different torso lengths for maximum convenience and comfort. It even comes with a rescue whistle buckle for emergency. What we love about this backpack is that it is lightweight. This makes it suitable for long trips where you need all your gear without feeling restrained. The shoulder straps are padded for extra comfort whether you are on or off your mtb. It features 2 front pockets to help you sort your accessories. 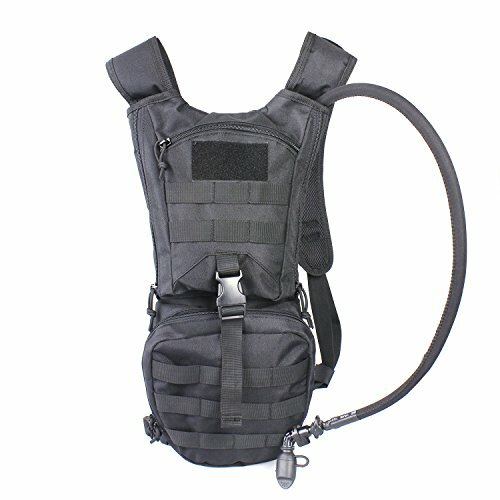 Both pockets feature MOLLE system to add more gear. The internal storage is big enough for everything you might need on the trail. This pack is very well made from high-quality polyester with PVC lining. It is almost 100% resistant to tears although it is budget friendly. The mesh back will allow for more breathability to keep you cool all day. It features a 2.5 Liter bladder to keep you hydrated. The tube is very easy to use while you are on your bike. Your water will stay cool even in hot weather. Moreover, you will be able to fill the reservoir with ice cubes for chilly all day long. Durable and lightweight mountain bike backpack. Very affordable price with enough storage for all your gear. Mesh back for extra breathability. The MOLLE spacing is a bit too wide. It might not work with everything. The design of the O-ring is rather loose. You might feel some air when you are trying to drink. This excellent backpack is big enough to carry all your gear. 1100 cubic inches are enough for everything you will ever need on a day on your bike. It is lightweight, adjustable and super comfy. The low profile design makes it suitable for men, women and teens. This is a practical back pack with adjustable straps that you can easily adjust to different torso lengths. As a result, you will never feel that the straps are sinking into your shoulders even when you wear this pack for hours. They are also mesh covered to keep you comfortable and cool. The back features air mesh padding for extra comfort and more airflow. The chest shock absorbing strap will help distribute the weight more evenly. There is also a whistle buckle that will come in handy if you are in danger. 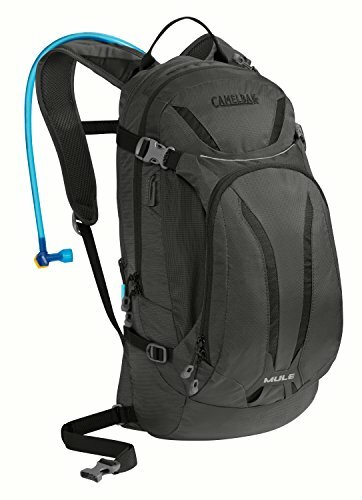 This mountain bike backpack comes with a BPA free 2 liters hydration bladder. This is very safe and healthy to use when you are on your MTB. It even has a big opening that will allow you to add ice cubes to keep your water cold and clean the tube easily. Some backpacks are heavy even when they are empty, but this is not one of them. It weighs only 2 pounds and features enough pockets to carry all your gear and accessories. It features a large pocket with a weather guard that will protect your belongings and food. The 2 pouches will help you sort your accessories out. It also comes with a special system to hang your hook and a butterfly opening for your jacket. Big internal storage with pockets and pouches to help you keep your gear organized. Adjustable shoulder mesh covered straps. BPA free 2 liters water bladder with a wide opening. Shock absorbing chest strap to distribute weight more evenly. The mouthpiece of the bladder has no cap. 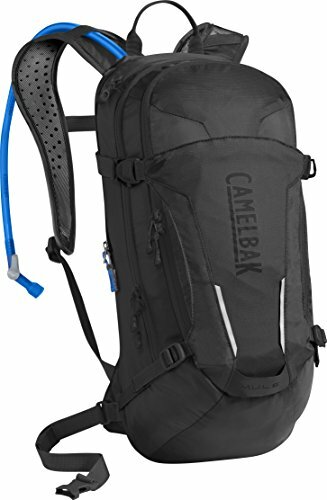 This is by far one of the most affordable backpacks that you can easily wear while mountain biking. It is tear and water resistant. Thanks to its sturdy construction, you can be sure that it will last for long. In spite of its small size, this backpack is big enough for all your gear. It is very lightweight, yet it has enough room for everything you will need while exploring rough terrains. This doesn’t come with a hydration system which makes it suitable if you are on a tight budget. But it has 2 bottle holders on both sides, allowing you to carry all the water you need on a day out. Moreover, the pockets come with straps that will keep the bottles in place. 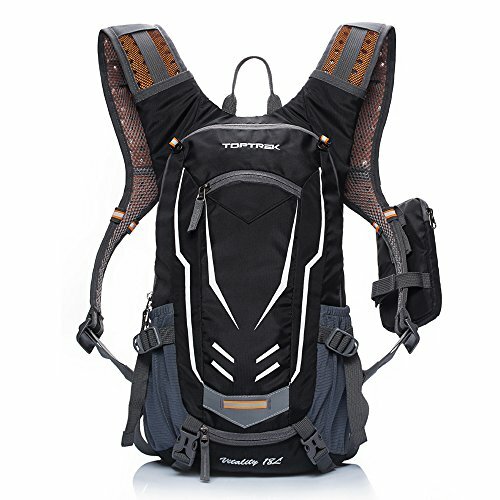 In fact, it is suitable for all sorts of outdoor activities where you need a reliable backpack to carry all your gear. You will not feel strained after wearing this for long hours. The mesh covered straps are breathable to keep you comfortable and cool. Moreover, you can adjust the length of the straps to better suit your body. Very lightweight backpack with enough room for all your gear. Tear and water resistant durable nylon. Mesh covered adjustable shoulder straps. 2 pockets with straps for water bottles. Not suitable if you have a larger build. This nice mountain bike backpack is made of high-quality nylon. It is anti-scratch and water resistant. It will stay great regardless of the harsh conditions. The ergonomic design makes this very comfortable to wear. It comes with hooks for extra stabilizing the bladder and keeping it in an upright position. It also features a helmet net to help you secure your helmet when you don’t need it. You can easily keep this at the bottom of the bag. With this backpack, you will never worry about riding at night. The reflective straps will keep you visible to everybody on the road. Moreover, you will be able to adjust the shoulder straps to perfectly fit your body. The chest and waist strap will keep it in place and help better distribute the weight. EVA foam on the back and on the straps will keep you comfortable as it perfectly fits the contours of your body. In addition to the water resistant fabric, this bag also comes with a rain cover. Using it will ensure that all your gear will remain dry regardless of the weather. It even comes with a removable phone bag that will help you keep your phone safe while exploring challenging trails. Pockets for the water bottles. Foam covered back and shoulder straps. Rain cover to keep your gear dry. Zippers are not of the best quality. This is a pack that you can certainly wear for long hours. It comes with adjustable shoulder and chest straps. These will keep the bag in place when you are on your bike. This means that you will not feel it bouncing or moving as you explore rough terrains. Moreover, these straps will help better distribute weight for more comfort and convenience. Whether you have a small build or a big one, this pack will fit you perfectly. It is made of durable 600D polyester. It is water and scratch proof. Because hydration is of great importance, this pack comes with a 2 liters hydration bladder that is made of BPA free plastic and silicon. It will not leak thus keeping all your stuff dry. It features a dust cover with a wide opening to help you better clean the bladder. Moreover, the neoprene insulated tube will help keep your water cool for long hours. We love that this pack comes with interior and exterior pockets for all your tools. Nothing will get lost inside this bag that is big enough even to fit a laptop. Moreover, there are external attachment points to help you carry even more gear with no problem. You will be able to keep your phone safe with a special port to use your headphones without getting it out. As a bonus, the padded back section will enhance the airflow between your body and the pack. You will not feel hot even if you wear this pack for a long mountain biking adventure. In spite of all these great features, this backpack is quite affordable. Padded back for enhanced airflow. Internal and external pockets for all your gear. BPA free hydration pack with big opening for easy cleaning. Some of the pockets are too small. This is a versatile affordable backpack. It is very lightweight yet features military grade durability. Although it weighs only 1 pound, it will keep all your stuff safe and dry. The hydration pack features a 2L bladder that is BPA free and FDA approved. It has a wide opening that will allow you to properly clean it and even add ice if you want to. It is also designed to keep your water cool for up to 4 hours regardless of the weather, thanks to the Miracol thermal-insulation technology. This is one amazing pack with a lot of pockets. They come in different sizes to fit everything from an extra jacket to your phone. Different storage compartments will keep your stuff safe and clean when you are on a rough trail. You will even get easy access to your headphones to enjoy your favorite playlist. You will not feel any discomfort carrying this backpack all day long. The adjustable shoulder and chest straps are designed to fit your body. They are also padded so they will not sink into your skin. The back and straps are covered in breathable material that will keep your body cool. Durable lightweight mountain bike pack. 2 Liters FDA approved and BPA free bladder with a wide opening. Different pockets to carry all your belongings. Adjustable straps for a better fit. Breathable back and shoulder straps for more comfort. The mouth piece is not of the best quality. It tends to leak if you are not extra careful. Extra weight will slow you down and you don’t need that. At the same time, you want to make sure that your backpack is durable and sturdy. This pack offers the best balance. It is made of high-quality water resistant and tear resistant nylon. You will also enjoy the different compartments and pockets that will grant you easy access to all your accessories. 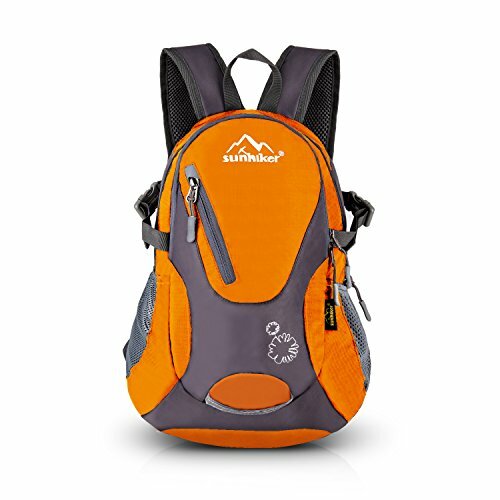 The backpack features a high-quality TPU 2 liters bladder that is BPA free and FDA approved. The big mouth will allow you to pour water easily and add ice if you want to. You will also be able to clean the bladder with no problem whatsoever. This wonderful MTB backpack features foam pads that are designed to keep you comfortable and cool after long hours on the trail. The straps better distribute the weight while the waist straps will keep it stable when you are on the trail. Moreover, the straps are covered in reflective material that will keep you visible at night time for enhanced safety. This pack has a whistle on the chest strap to help you in case of an emergency. It even comes with a rain cover that will keep your pack dry regardless of the weather. Big backpack to carry all your stuff. Different sized compartments and pockets. 2 liters TPU bladder with wide opening. Foam covered back and straps. Adjustable chest and waist straps with a whistle for safety. There is no rubber O-ring to prevent leaks. You don’t need to spend your money on a backpack that will break down in no time. Your pack should be sturdy enough to handle big weights. At the same time, it is a good idea to make sure that the fabric is scratch and tear resistant. If you tend to go mountain biking under the rain, then a waterproof backpack can definitely come in handy. It is very important to choose a pack that has a lot of pockets and compartments. Make sure that they are perfectly designed to fit your mtb accessories and tools. These will help you find things easily when you are on the trail without having to waste time or stop cycling. Some packs also come with extra attachments that will allow you to carry more gear easily. These are definitely more suitable for longer trips. Wearing a backpack for long hours can get a little bit uncomfortable. This is why you need to make sure that you are picking one that will not make you feel hot. Some of the high-quality models come with special air vents for better airflow. Foam can also help relieve some of the pressure. You also need to make sure that the straps are mesh covered and padded. This means that they will not sink into your shoulders or cause blisters after a long ride. Adjustable straps will allow you to find the perfect fit for your body. Whether you have a big or small build, your backpack will be comfortable to wear. At the same time, high-quality straps will help better distribute the weight evenly. Waist and chest straps will keep the pack in place when you are on your MTB and will prevent it from bouncing. You need a convenient hydration bladder that is big enough to keep you hydrated all day long. Make sure that it is big enough to carry all the water you need for a day on the MTB. It should be made of high-quality BPA free material that doesn’t contain harmful chemicals. As you carry your belongings in the bag, you want to make sure that they are always dry and safe. 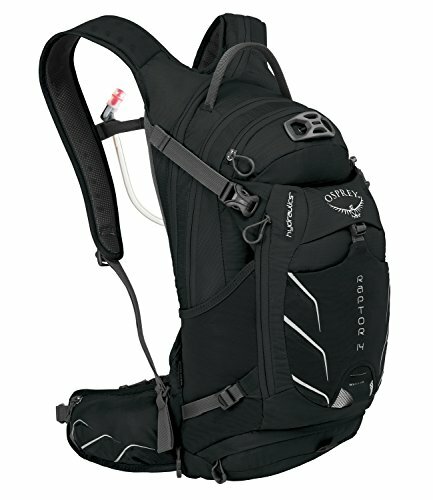 Invest in a high-quality pack that features a safe hydration bladder. This shouldn’t leak and should keep your water cool. Some bladders feature bigger openings so that you can easily clean the insides and even add ice if you need to. Nobody understands the importance of the biking backpack until they actually need one. A good back pack will grant you easy access to all your tools and gear without having to take your eyes off the trail. Moreover, you will stay hydrated and in good shape for an exciting adventure on your mountain bike. All you have to do is to make sure that you are buying a durable backpack that will be big enough to carry your tools and you’ll be good to go.